We have already had that in Marrakesh and will do the same in Mexico next week. Not for the original 2015/15 common power train version of Gen1 we haven’t. If I’m not mistaken Monaco is the only unchanged first season venue which will be raced at this year. I would love to see the full Monaco circuit used by FE, maybe season 7 will be the right time for the FIA. If not Gen3 will be next up with the biennial set up. Edited by Ben1445, 10 February 2019 - 10:17. 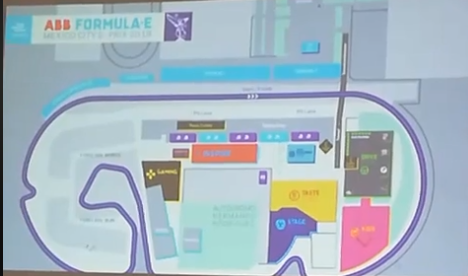 At the event presentation conference they showed the circuit map, and T1 looks different to me, much more open & flowing with the old oval. Maybe it's a mistake, but would be weird as everything else is correct there. Well, i guess we'll know soon! Edited by thegamer23, 10 February 2019 - 11:03. That is curious, my gut tells me that it's a mistake but who knows. I'll be interested to see if the FIA pluck for 3 Attack Mode activations this time or change the time they're active for. They've all been 2 activations for 4 minutes each so far. Crazy thing is I don't think that's an impossibility within the next couple of decades. But who knows. The Monte Carlo rally has already had some editions outside the WRC, so why not. ^ Indeed the Monaco Grand Prix has also existed since 1929, predating F1, and doesn't even conform to the 305km minimum for F1 race distance. Crazy thing is I don't think that's an impossibility within the next couple of decades. Lets just say that for Gen 3 FE nearly doubles it's battery range again and/or adds fast recharge capability, allowing them to achieve over 100 miles race distance at Monaco. At this point the world is increasingly focused on sustainability as we move towards 2030, bans on ICE sales in various key markets start to loom very close indeed, EVs saturate the luxury vehicle market and Monaco, synonymous with luxury, is no exception. By this point there may be more EVs on Monaco's roads than ICE. 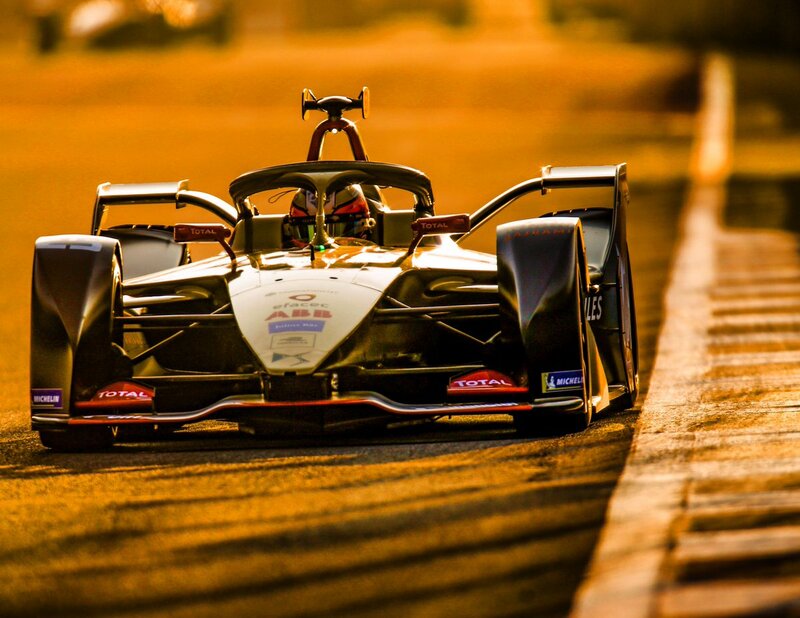 Maybe the Automobile Club de Monaco decide the best chance for the survival of the Monaco Grand Prix beyond 2030 is to award the race to Formula E, with whom they already have a relationship. 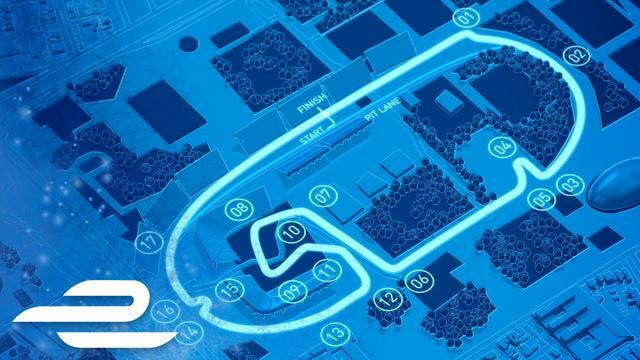 Formula E takes over the event and keeps the 'Grand Prix' name for Monaco only and allows as many recharging stops as the teams like, with the rest of the races remaining as shorter ePrix. Monaco takes the place of a special event like the Indy 500 or Le Mans within the FE season. Not saying it will. But it could. ​It's plausible. I'd certainly vote for F1 to drop Monaco. it is a stupidly tight track and hopeless for proper racing. FE are welcome to it. Mexico was first used in season 2. At least 2 maybe 3 teams still used the original powertrain from season 1. Berlin templehof was used in season 1 but was a completely different layout. I do hope fe use the full Monaco circuit next time they come back (season 7?). I don't think the fe race at Monaco will ever be called a grand prix. But I do think f1 has out grown Monaco. I hope by 2030 fe will use Monaco every year and f1 only every other year. Oh, you’re right, I had forgotten about the carry over teams using session one powertrains in season two. Though if we’re being very picky, Mexico had a first corner change in layout from the wibbly wobbly bit to a straightforward right handed apex clip so it’s not going to be as pure a conparison to season 1 as Monaco will be. Edited by Ben1445, 10 February 2019 - 23:09. I revise my hypothetical future, it will be known as the Monaco Grand ePrix! No, I don’t know really. Formula One will undoubtedly want to hold on to Monaco, unsuitable or not. There’s too much prestige and provenance to the race for them to abandon it. That’s why I considered it would more likely be action on the part of the Automobile Club de Monaco and what they want the race to be rather than anything else. Mexico City e-Prix coming this saturday, one of the highlights of the season! Formula E + Jaguar I-Pace action! Edited by thegamer23, 12 February 2019 - 11:23. Edited by thegamer23, 11 February 2019 - 16:39. Ok, I mean that’s always been a VERY nice livery but it is more motorsport obsession with nostalgia. Add to that it’s more accidental tobacco advertising as the brand in question still exists. I’m not against throwback liveries but dear god have we had a saturation of the market in recent years. Especially from damn Porsche. 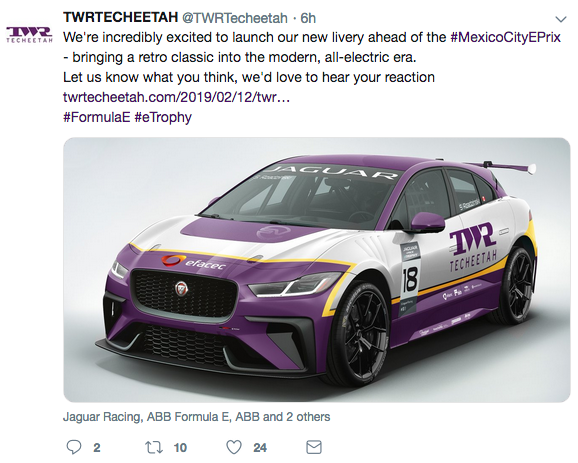 Having said that, having the TWR name back and on a Jaguar may be cause for celebration enough. It’s not often that happens. I can see Maxhimilian partying hard for this. Race thread a little bit late this time around, coming later tonight or tomorrow. Edited by thegamer23, 13 February 2019 - 16:06. I’m not against throwback liveries but dear god have we had a saturation of the market in recent years. As was in the Thursday Mexico Notebook, there's a possibility of fast recharging in the race for Gen 3. Similar race pace but for longer? Faster race pace but for 45 minutes as it is now? Fast recharging would translate into massive performance boost for the battery weight reduction alone. Gen 3 are going to reach F1 levels of acceleration (0-200 km/h) & the races could be much longer, if they want to! I like the short race format tho, simiar to MotoGP races lenght, maybe they can extend to 1 hour. Edited by thegamer23, 15 February 2019 - 14:49. Fast recharging would be very road-relevant, so I could see the teams pushing for that. I think what would probably make most sense is indeed to downsize on the battery - shortening charging time and lowering weight. Make them nimble and fast. I'd probably also keep the 45 minute races, it just seems like a length more palatable for modern tastes. just go faster during them. Seeing how fast the cars looked in Mexico and how some people thought they had outgrown the track, I really hope they have made some improvements to the track in Hong Kong.. I don't believe we'll see much difference but as I understand it the future of the race after this season semi-hinges on modifications to the layout to suit the Gen2 more. I must say I'm worried about Paris and it's future, which I think will be one of the most unsuitable for Gen 2 of the season in my opinion. I should be spectating the Paris race - I'll let you know how it looks from the spectator's perspective! Has anyone else noticed that next race in Hong Kong will be the 50th ePrix since Formula E began? Next stop. Hong Kong, the week before F1 starts! Let's hope for a slightly revised layout. Hong Kong is going to be live on BBC2 apparently. I think that's a shame as it's not one of he best FE tracks and it'll be on at an unusual time too.. not too likely to attract many viewers. The batteries, created by Williams Advanced Engineering, have been collected and are already in the recycling process, which comprises of sorting, dismantling and recycling. Here, the valuable metals are carefully recovered using proprietary and unique smelting technology - followed by hydrometallurgical treatment. The metals in the battery are infinitely recyclable, without losing any of their properties. After the batteries are carefully taken apart - using methods to ensure the environment isn’t exposed to hazardous compounds - the metals and metal alloys will be used again in new rechargeable batteries or other products. With the number of people who voice concern over the horror of EV batteries sitting around in scrapyards leaking toxic chemicals, that feels significant. I'd definitely prefer a longer race, my main issue with FE (besides the thankfully inconsequential fanboost) has always been the length of the races, they just seem over way too quickly and feels like less of an event to me because of it. Obviously I get the range issues that have forced that, and also get why they prioritised getting rid of the car swap first for image reasons and to make space for more teams in the paddock, but if there is the capability in future to race for longer I'd like to see it happen. Makes too much sense. They should have consulted with me to begin with! ...except that the statement carefully avoids mentioning the toxic chemicals, and just concentrates on the metals - which were never the problem. They are probably dumping the toxic waste down the lane behind the factory. So that’s not down the back of the lane then. Edited by Ben1445, 19 February 2019 - 21:16. A retro what-if livery exercise I can get behind. Season 1 liveries on the Gen2 car. I understand what you mean, i would rather a longer race, but for a casual fan i would say that 45-50 mins is too long. Especially if large parts of the races are waiting for the battery energy to go down before the chaos ensues in the final laps. From basic napkin maths, I would expect that for a 1-3 stop race with roughly the same usable energy as Gen2 would take 1-4 minutes per pit-stop for the expected power of future ultra-fast charging (anywhere between 350-800kW are being tested by various firms), depending on what combination of variables (recharging power, number of stops) you pick. It would be more like an endurance pit stop than F1 in that sense. But compared to what FE does with it's standard 100kW recharging it brings recharging races from non-starter to actual feasible prospect. In practice though, I think a single stop top up is more likely at least as a starting point to introduce the tech. I'd set the races at maybe 20-50% longer than the initial fully charged battery would allow then let the teams choose for how long they would like to stop for and recharge for. I just sort of agree that there's a crazy number of retro-what if liveries knocking around recently and they're getting a bit stale. But this one is novel and interesting, so I thought it was worth sharing. Edited by Vielleicht, 21 February 2019 - 15:15. Get what you mean about introducing the technology. But the change in battery weight will make quite a difference too. If you were to recharge at 600kW for 1 minute, you'd need at least a 10kWh battery to store the energy delivered. 10kWh using the same energy density as a Gen2 battery is only about 70kg. Stick that in the back of a Gen 2 and the cars total weight goes down to less than 600kg, less than two thirds of the current car. When you're not lugging all that extra weight around, you're going to be able to go either faster or further or a bit of both. I'd imagine over in whatever offices and meeting rooms they're evaluating potential Gen3 rules, all sorts of possibilities have been looked at in much more detail. This season i’m not a fan of the Venturi or HWA livery, other than that all pretty good. Spokeswoman for the City of Vienna "Formula E as a sport that promotes sustainable mobility is, naturally, an interesting platform for a modern and future-oriented city. We are currently talking to Formula E and we are evaluating the framework to possibly be considered as the venue for a race in Vienna, but it is too early now to talk about any details." Did someone say ....a game?! I know they’re plotting that live ghost racing thing in which you can race in real time with the drivers on track. But I’m not sure what platform they were planning on doing that. Can’t say if it’s a big release like an F1 game or a smaller thing like a standalone Real Racing or integrated into another game. Oh that's a point. The thing for me is that a game/sim must have good physics or it's not really worth it for me. If Virtually Live's platform is like Real Racing 3 it won't be something I'd be massively interested in. If it's something more substantial then it could be fantastic. Interesting note in this article; apparently the top FE earners make similar money to "established Indycar drivers, not including prize money", and it says the top drivers make between €1 million and €1,6 million a season.